VIENNA, Austria – The 2006 Austrian market took delivery of about 390,000 bicycles. With an average yearly home consumption of some 480,000 units over the past 25 years, this is on the low side, although there was a 4% increase compared to 2005 (375,000 units). Problem with the Austrian statistics is that only the figures for bikes sold and home production are, to a certain degree, reliable. For 2006, ‘Statistik Austria’ calculated a domestic delivery of 390,000 units. 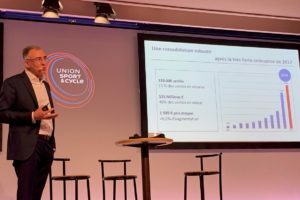 Home production – mainly based on Austria’s leading bicycle maker KTM Fahrrad GmbH plus a handful smaller, but high-end producers like Simplon – is said to be 135,000 units (compared with 2005: minus 3.6%). Source: Statistik Austria/EUROSTAT, Arge-Zweirad, Bike Europe estimates. * The 2005 figures are based on estimates and were recalculated by Bike Europe. *** As usual, the figures somehow do not match. According to the calculation, 2006 domestic deliveries would have been 373,000 instead of 390,000 units. The Austrians explains this gap of 17,000 units with sales of overstock in the next year. It is curious to note that KTM’s GM Josef Spiesberger claims a production increase for his company whereas the nation’s statistics show a decrease. Obvious mistakes within the stats of Austria/Eurostat figures haven’t been solved satisfactorily yet. The common formula ‘home production minus exports plus imports = total delivery’ again doesn’t match (see chart). According to Statistik Austria, bike exports in 2006 have been 112,000 (plus 17.8%) and imports 350,000 units (plus 6.1%). That would mean that the calculation for domestic delivery comes at 373,000 instead of the mentioned 390,000 units. What fills the gap of 17,000 units? Helge Fellner, marketing director at Austrian Shimano importer Thalinger Lange GmbH, suggests that these 17,000 units have been (over)stock from 2005 in the various distribution channels. These are supposed to have been sold in 2006. Major bicycle sellers in Austria, unit-wise, are still the large sporting goods chains such as Intersport, Hervis, Giga Sport, Sport 2000 and Zentra. All in all, they were selling 59% of last year’s Austrian 390,000 units home delivery (= 221,250 units). Note that these market shares are based only on January to September 2006 sales. Clothing and apparel sells best through the sporting goods chain stores. The biggest Intersport, Austria takes an estimated 55% in value for P&A, followed by IBD’s (45%), mass merchants (3%) and mail order suppliers/e-commerce (5%). Second-largest distribution channel for bicycles were IBD’s with a 28% market share, followed by mass merchants with 13%. 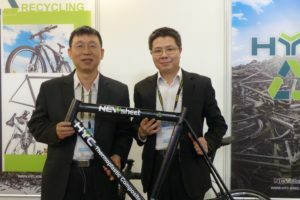 In terms of value, bicycle sales were also led by the sporting goods chains (51%, compared with the previous year: minus 1%) followed by IBD’s (stable 45%) and mass merchants (3%, compared with 2005: minus 4%). A look on the achieved average sales prices as well as on the sales value by these three distribution channels, gives a clear image of how different their respective product offering (low-, mid- and high-end) is. 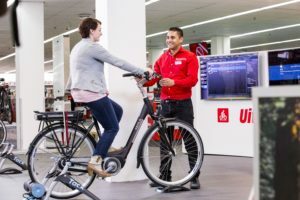 According to Statistik Austria, the average sales price for a bicycle sold through IBDs was € 865; a bike sold through sporting goods chains costed € 465 and the one bought at a supermarket retailed at € 115. In other words: The average sales price reached by IBD’s was close to double that of the sporting goods chains and more than seven times(!) higher than the bikes sold by supermarkets. On average, in 2006 a bicycle sold in Austria costed € 531,50. Unlike Germany – and undoubtedly due to a ‘nowhere-flat’ countryside – the leading bike model is the ‘good old mountainbike’ that reached a strong 33% share (compared with 2005: plus 2%). Austria’s definition of a mountainbike is the fully-equipped offroader that is not suitable for real offroad riding. The ‘real thing’ is called the offroad category by the Austrian statistics. This category took a 13.2% market share (was 11.9). Trekking bikes reached 28.5% (was 26.2%) followed by city bikes 6.5% (was 7.3%), road bikes 3.3% (was 3%) and kids- and juvenile bikes (15.5% (was 14%). All figures are based on January – September 2006 data. 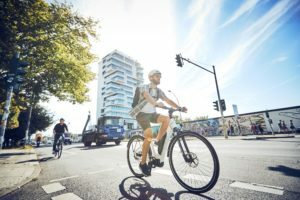 According to the latest market analysis, Austria’s 2007 bicycle sales will be much better than in the previous three years. Not only the fantastic weather conditions at the season’s opening but also the economy in a better mood leads to forecasts of a total domestic bike delivery of 410,000 units. The future seems to be bright. The political theme of urban mobility has struck as a hype in Austria. Various political decisions in favour of two-wheelers have been taken, like for instance a pilot project in Vienna allowing powered two-wheelers to make use of bus lanes. These measures had their effect on sales. In 2005, the 50cc class saw a two digit sales increase of 28%, with the 125cc scooter class only 2% up. In 2006, it was just the other way around: the 50cc scooter class upped 5.8% on 2005, but the 125cc class won a huge 43.6% over the previous year. 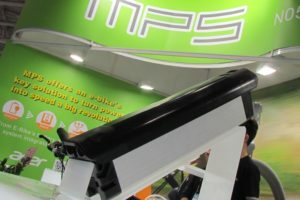 According to figures of the Austrian motorcycle importers’ and producers’ association Arge-Zweirad and Eurotaxglass Österreich GmbH Automotive Business Intelligence (Eurotax in short) the 50cc category grew to a total of 28,292 units in 2006. The 50 to 125cc category boomed 43.6% up to a total of 4,859 units. In the category of 125cc and over sales increased 1.3% up to a total of 11,108 units. Scooters held a very strong 63% (= 17,960 units) market share in the under 50cc category, followed by enduros (20% = 5,787 units), sports bikes (9% = 2,614 units) and ‘others’ (7% = 1,915 units). Scooter brands like Aprilia, CPI, Kymco, Peugeot, Vespa, Explorer, Chracker and Kee Way Motor experienced the largest (mostly two-digit) 2006 sales increases. Scooters are also leading the top-five in the 50 to 125cc category. In 2006 a total of 3,344 scooters have been sold in this category, representing a market share of 69%, followed by ‘others’ (18% = 856 units), enduros (8% = 377 units), choppers (3% = 169 units) and sports bikes (2% = 113). Austrian top scooter seller in the 50 to 125cc category was Honda with 1,002 units (representing a strong 30% market share), followed by Vespa (528 units = 16% market share) and Kymco (534 units = 16%). Leading the top five of the over-125cc sales in Austria 2006 is again Honda (2,426 units = 21.8% market share) followed by Suzuki (1,774, 16.0%) and Yamaha (1,728, 15.7%).